You can use the Map Drawing Tools to draw your own boundary to create and save a discreet geographic area (My Neighborhood). You can then use the My Neighborhood area in a search or to show information on specific areas which do not follow regular neighborhood boundaries. Start with a Text Search to narrow your area. On the map, click Road or Aerial view. Click a drawing tool to select your shape. Circle: Click the point that will be the center of your Circle, and drag outwards. Rectangle: Click the point that will form one of the corners and drag over the area to include the required area. Polygon: Click once to start the Polygon, then again for every change in direction to create each point of the Polygon. End the Polygon by clicking again on the first point to complete the shape. The first point turns dark to indicate that you have made the connection. When you release the left mouse button, the Layer Options Menu displays. Tip: If you draw a shape incorrectly, click the Hand icon next to the Polygon tool to stop the active drawing. Then, click the appropriate tool to start over. Use: to use the shape boundaries in your search. Find schools: to display schools within the shape boundaries. Tip: Regardless of which shape you use, the menu will always ask you to Save. 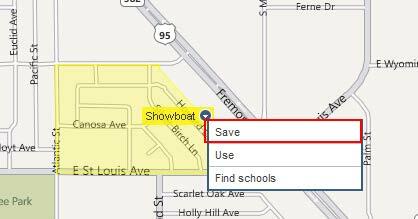 If creating a polygon, enter a name for your neighborhood in the NAME YOUR NEIGHBORHOOD dialog box and click Save. A label appears, displaying your new neighborhood name. Click on the down arrow icon at the right hand side of the My Neighborhood name to access more options like Rename, Remove, Use, and Find schools. Tip: Click a Neighborhood name to display boundary points which you can click and drag to resize a saved neighborhood and to expand your search. Click on the down arrow icon to Update or Restore Polygon points. Turn off the Neighborhood layer, and hide the multiple city-assigned neighborhoods. Easily see only the neighborhoods you need. Change the shape of neighborhood borders to suit your needs. Create a new neighborhood from overlapping, existing neighborhoods including city-assigned neighborhoods, your own neighborhoods, and school districts. Combine two adjacent neighborhoods into one. On the map, expand the Layers menu and select the Neighborhoods check box. Neighborhood names display with yellow labels on the map. Click the name of the neighborhood to display the boundaries. Click on the down arrow icon () at the right hand side of the neighborhood name to access more options and select Save from the drop-down list. Enter a name for the neighborhood and click Save. Next Lesson: Getting Started With Reports in Find.